Portage Lake Logo, white on green. Do not make copies of these pictures. January 1898 "The game of hockey was introduced into Houghton last Friday evening by a game between two teams from Dollar Bay." the local paper wrote at the time. The only covered ice rink at that time was in Dollar Bay. 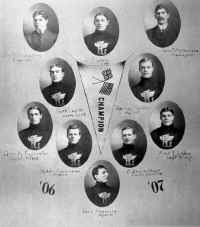 1899 The Portage Lake ice hockey team formed. Note there were four Doctors on this team! Source of names: The sports section of the 1924 Michigan College of Mines Keweenawan pictorial book from the local college now named Michigan Tech University. Top Row L-R: B. Potter (Lt Wing), Ellsworth, Dr. R.B. Harkness, Black, Dr. E.R. Hay. Seated L-R: Thompson, Dr. J.H. Gibson (Cover Pt), C.E. Webb -mgr, Dr Percy H. Willson (Rt Wing), Delaney (Point). Kneeling L-R: Wally Washburn, Andy Haller (Rover). Members of the 1899, 1900, 1901 team also included Rowe at Forward. C. Yates and Dr. H.B. Harkness were officials. "The highly rated officials at the time were C. Yates and Dr. HB. Harkness." Source: The local Houghton newspaper, the Daily Mining Gazette, dated August 1, 1961. 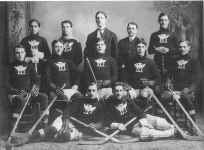 In 1902-03, a four team league played in Michigan's Upper Peninsula: Houghton, Hancock, Laurium and Sault Ste. Marie, all of Michigan. Standing L-T: A Haller -Sub, J.H. Stephens, C.E. Webb -Manager, L.J. Ames -Trainer, J.C Baker -Point. R. Rowe -Left, J.H. Jones -Goal, C.E. Wescott -Right, H.E. Meinke -Center. All the sticks in their picture have MIC-MAC stamped on them, and the goalie stick was not any bigger than any other stick in the picture. 1903-04 In this season, the local league expanded to take in Pittsburgh and Minneapolis. 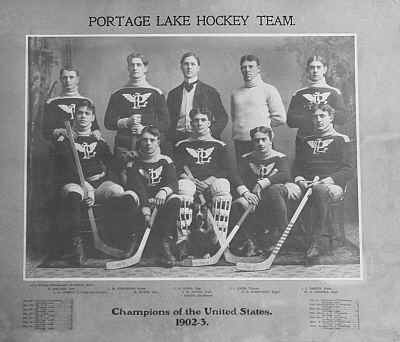 The 1904 Portage Lakes won the American Championship over the Pittsburg Victorias and the World Championship over the Montreal Wanderers who were who were billed as the Champions of Canada at the time. 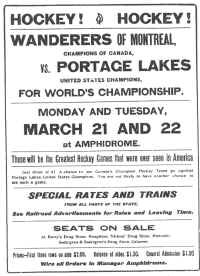 The Portage Lake team "had made every effort to play the top teams of Canada" but could not, because the Amateur Canadian teams would be banned from their league if they played a professional team. Referees: J.H. Booth -2 games, Dr. Harkness -1 game, James P. Mooney -1 game, Roy D. Schooley -6 games, Dr. Percy Willson -12 games. and 49 goals for their opponents! 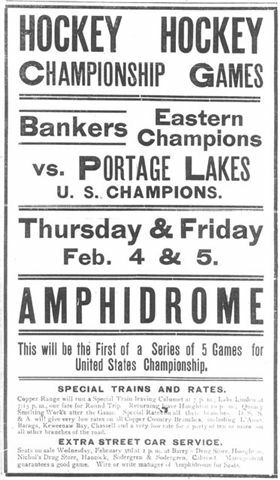 In March, 1904, the Wanderers sent a challenge to the Portage Lake team for the Championship of the World. 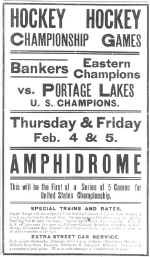 This ad appeared in the Daily Mining Gazette Newspaper in Houghton, Michigan announcing the game that the current Champions of Canada, the Wanderers, would play against the Portage Lake team, the Champions of the U.S.
Portage Lake won both games convincingly, 8-4 and 9-2 and the Portage Lake team was proclaimed the 1904 Champions of the World! Bert Morrison 12 games, 9 goals. Standing Lt to Rt: Hod Stuart, Charles E. Webb (manager), John L. "Doc" Gibson. Seated Lt to Rt: - Ernest Wescott, William "Cooney" Shields, Bruce Stuart, William Riley Hern, Bert Morrison. 17 Wins, 7 Losses, 2 Ties. 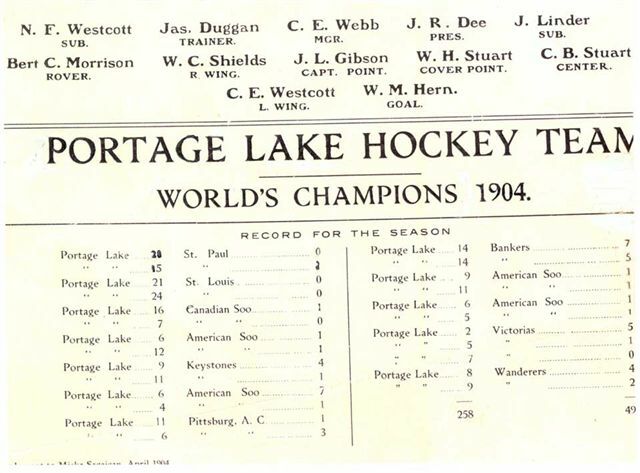 Please Contact webmaster if you have a different picture of the 1904-05 Portage Lake team. 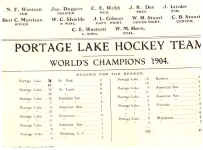 1905-06 The Portage Lake team was the International Hockey League Champions. C. Bruce Stuart -Captain, Barney Holden, John T. McNamara -Manager, Grindy Forrester, W.M Riley Hern -Goal, Joe H. Hall, Harry Bright, James W. Duggan -Trainer, Walter A Forrest, Fred W. Taylor, Red E. Lake. 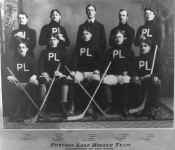 1906-07 The Portage Lake team was the International Hockey League Champions. Barney Holden -Point 20 games, 3 goals. Top 3 L-R: Jas M Duggan -Trainer; Darcy Regan -Goal; John T. McNamara -Mgr. Fred W. Taylor; Barney Holden. Grindy Forester; Goldy Cochrane; C. Bruce Stuart -Capt. ; Fred E. Lake. 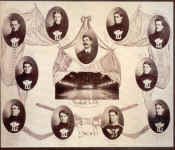 Following the 1907 season, the professional Portage Lakes broke up, the team kept playing, but played as an amateur team. Many of their past stars returned to Canada to play pro hockey on newly formed Pro teams. 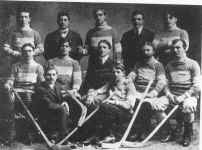 The first year in Canada that the Ontario Hockey League allowed their players to turn professional was after the 1907 season. After the International Hockey (Pro) League from 1904-1907 broke up, many players in the IHL league went on to play pro hockey for teams across the Nation and Canada. Click here to see a list of North American pro teams starting from the 1904 teams to present. Click here to see pictures of Houghton's Portage Lake Hockey Teams 1899-present. Harry Bright, 1904-05, 1905-06, 1906-07 Portage Lake Team -Rover. Harry (18-- to 19--) was born in Winnipeg, Manitoba. Harry Brown, 1906-07 Portage Lake Team. James R. Dee, 1903-04 Portage Lake Team, Pres. Red E. Lake, 1905-06 Portage Lake Team -Lt Wing. Fred Lake, 1904-05, 1906-07 Portage Lake Team -Rt Wing.